Harebrained Schemes has announced that Shadowrun: Dragonfall will be re-released in late summer in a heavily upgraded, standalone Director's Cut edition. 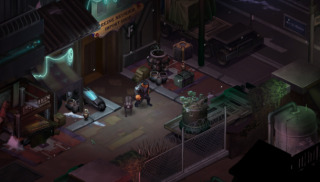 Shadowrun: Dragonfall earned a very respectable score of 81 in our February review , but citing the example of CD Projekt Red, which released " Enhanced Editions " of the first two Witcher games long after they originally came out, Harebrained Schemes has decided to take another run at it. "As with Shadowrun Returns, we heard feedback about some things that folks wanted to see improved or simply wanted more of," Dragonfall Game Director Mike McCain wrote in a new Kickstarter update . "We also heard many requests for a standalone version of the game - since it's narratively independent of the Shadowrun Returns campaign, players wanted to be able to dive directly into Dragonfall." Details won't be revealed until August but McCain said the Director's Cut will boast "new features, missions, art and more." It will be released in September on Steam, GOG and the Humble Store, and in another move perhaps inspired by CD Projekt Red, all Shadowrun Returns Kickstarter backers and anyone who owns Dragonfall will get it free.